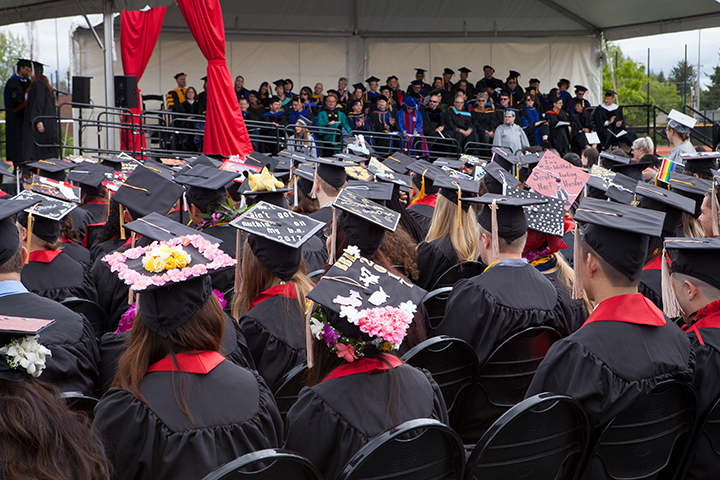 More than 350 candidates for a bachelor’s degrees and 370 for advanced degrees participated in Pacific University’s spring commencement exercises on Saturday, May 20, at Hanson Stadium on the university’s Forest Grove Campus. Family members and friends alike showered graduating loved ones with flowers, leis and other treats before and after each ceremony, both of which filled the stadium grandstands and field seating areas to capacity, with an estimated 1,800 spectators for each event. Distinguished University Professor of Physics Juliet Brosing gave the undergraduate ceremony keynote address to conclude an illustrious 30-year career that included countless accolades, including Oregon’s 2012 Professor of the Year award. She added that even if the coming days and years make it difficult to stay in touch, the Pacific community is a bond for life. 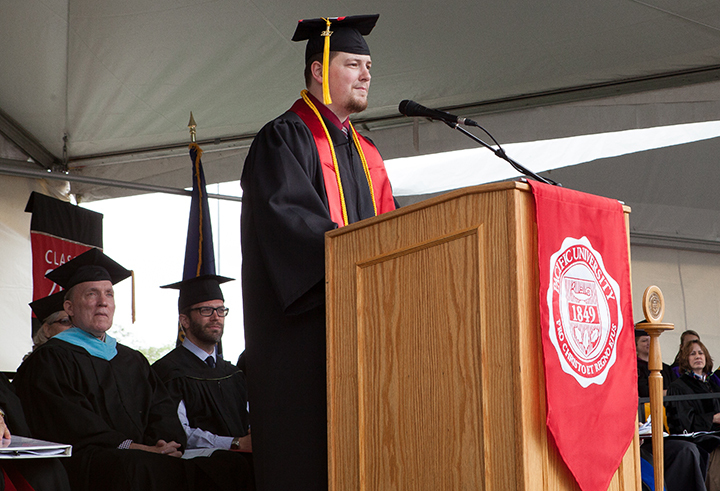 Physics/math double major Evan Carlson of Warrenton gave the valedictory speech. Carlson, a talented trumpet instrumentalist, was a member of the university’s symphonic band, as well as jazz and orchestra ensembles during this time at Pacific. Earlier in the week, Carlson was named Pacific’s outstanding senior in physics, outstanding senior instrumentalist and co-outstanding senior in mathematics. He challenged his classmates to make a positive impact on others rather than simply pursue personal greatness. 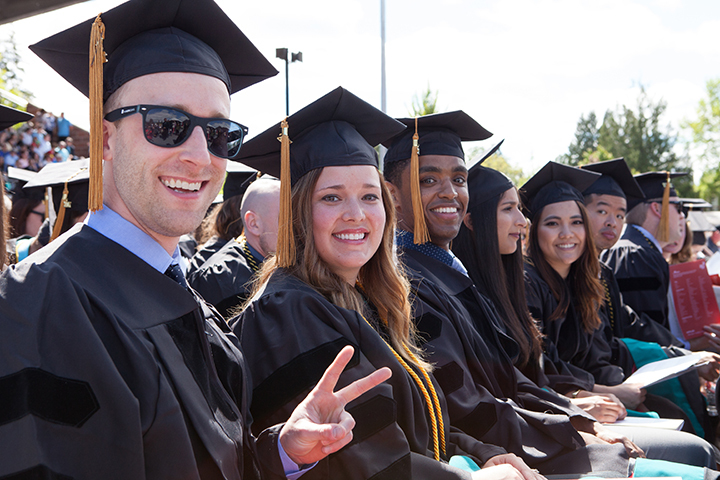 Within the College of Arts & Sciences, the initial three graduates of Pacific’s new bachelor of music therapy degree program received their diplomas, as did four others majoring in the university’s new criminal justice, law and society discipline. In the afternoon, advanced degree candidates in all five of the university’s colleges (Arts & Sciences, Business, Education, Health Professions and Optometry) received their diplomas, led by more than 90 doctoral students each in pharmacy and optometry, respectively. Prior to the awarding of degrees, students and faculty paid homage to retiring faculty member Sue Stein, who helped elevate the School of Pharmacy as its dean, and Nada Lingel and Bradley Coffey, optometry professors who mentored students at Pacific for 30 and 35 years, respectively. Other professional degrees awarded included master’s degrees in athletic training, business administration, education, social work, speech-language pathology, teaching, and vision science, as well as doctorates in physical therapy. 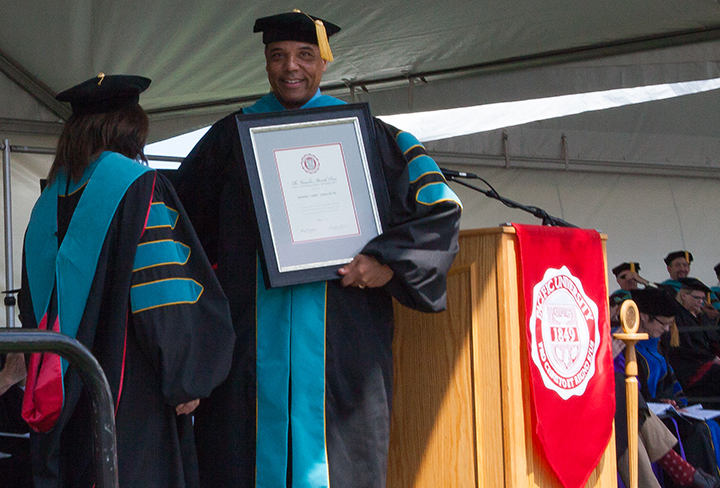 Prior to the awarding of degrees, optometry alumnus Larry Jones OD ’85 received the College of Optometry’s Kamelia Massih Prize for a Distinguished Optometrist. Dr. Jones, who coached football and was active elsewhere on campus as a graduate student in the early to mid-1980s, was a classmate of Massih, a distinguished Pacific optometry alumna and Portland-area practitioner committed to serving the less fortunate until her passing in 2010. Jones, who owns a successful practice in the Seattle suburbs of Kent and Renton, has been active member of the National Optometric Association for more than 30 years. He has worked with the state of Washington Legislature in promoting better vision screening protocols as well as providing vision services to young offenders. He also volunteers his service for the College of Optometry’s annual run/walk fundraiser and recently helped build the university’s student chapter of the National Optometric Association (NOSA), which have been very active in fundraising for the university’s new EyeVan.